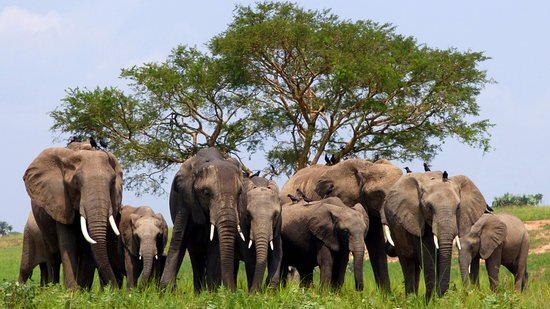 This 8 day private guided tour start in Kigali the capital of Rwanda. After visiting the Genocide Memorial we head to the beautiful white sandy shores of Lake Kivu. 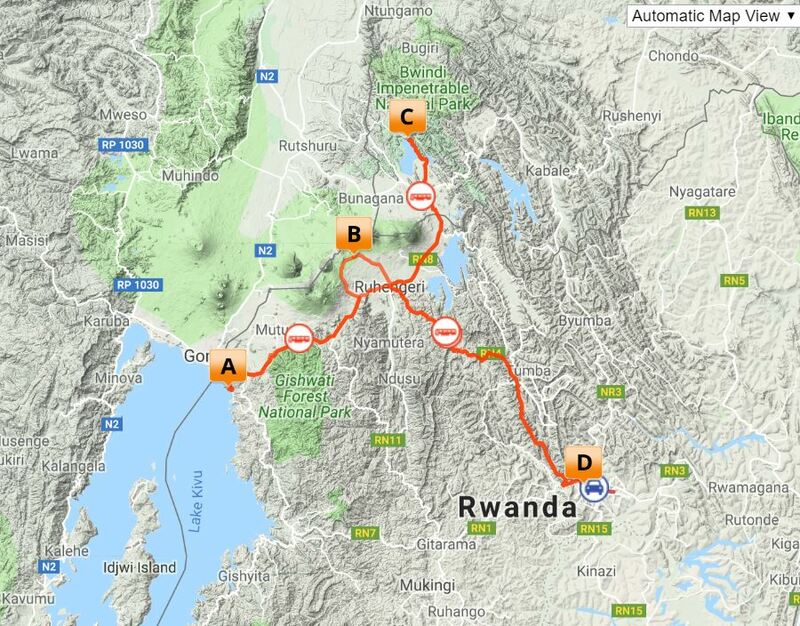 Hereafter we head to the Virunga Mountains where we will spend a morning trekking Golden Monkeys. The next 3 nights we stay on the rim of the breathtaking Lake Mutanda which will be our base for our Gorilla trekking in Bwindi Forest. On the last night we have a farewell dinner in the city of a thousand hills before we head home. Kigali – Peacefully nestled along picturesque hilltops, Kigali is a thriving African city immediately notable for its cleanliness, orderliness, and hospitality. Genocide Memorial – A permanent national genocide memorial in remembrance of more than one million victims of the 1994 genocide against the Tutsi. The memorial is a place of remembrance and learning where more than 250,000 victims of the genocide have been laid to rest. Lake Kivu – Lake Kivu, one of Africa’s Great Lakes, offers a tranquil atmosphere, sandy beaches and a glimpse into rural Rwanda. 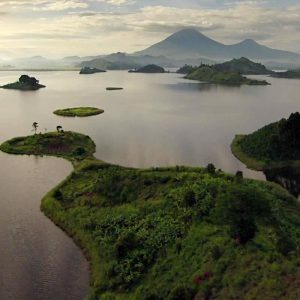 Virunga Mountains – The Virunga Region is one of the most beautiful places to visit in Africa. Nearly half of the world’s mountains gorillas live in the Virunga’s. Golden Monkeys – The Golden Monkey is one of the most beautiful and rare animals in the world. Endemic to Albertines Rift, the Golden monkey is confined to the Virunga Volcanoes. 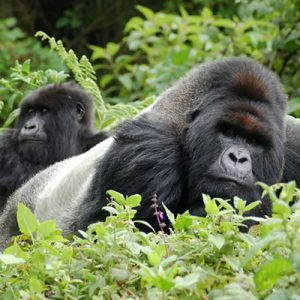 Gorilla trekking in Bwindi Forest – Uganda’s oldest and “Impenetrable” forest lies in the southwest corner of Uganda. 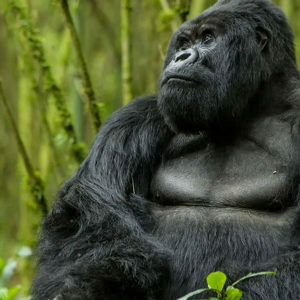 Declared a UNESCO world heritage site due to its ecological uniqueness and natural beauty, roughly half of the world’s total gorilla population live in this park. On arrival at Kigali International Airport you will be met by our representative and whisked off to the Gisozi Genocide Memorial & Education Centre. The site houses over 250 000 victims of the 1994 Rwanda Genocide and stands as a vivid testimony to the courage and reconciliatory efforts of the Rwandan people. After a light lunch at Hotel Des Mille Collines which featured in the movie “Hotel Rwanda” you will be transferred to the mellow lakeside town of Gisenyi. Although this drive is 4 hours it will give you the opportunity to see the Rwandan countryside known as “land of a thousand hills”. After arrival at your hotel Paradis Malahide which is set on the breath-taking Lake Kivu, it is time for a well-deserved shower before joining your friends at the beautiful setting of the hotel garden next to the lake for drinks. Some local entertainment will be followed by dinner. 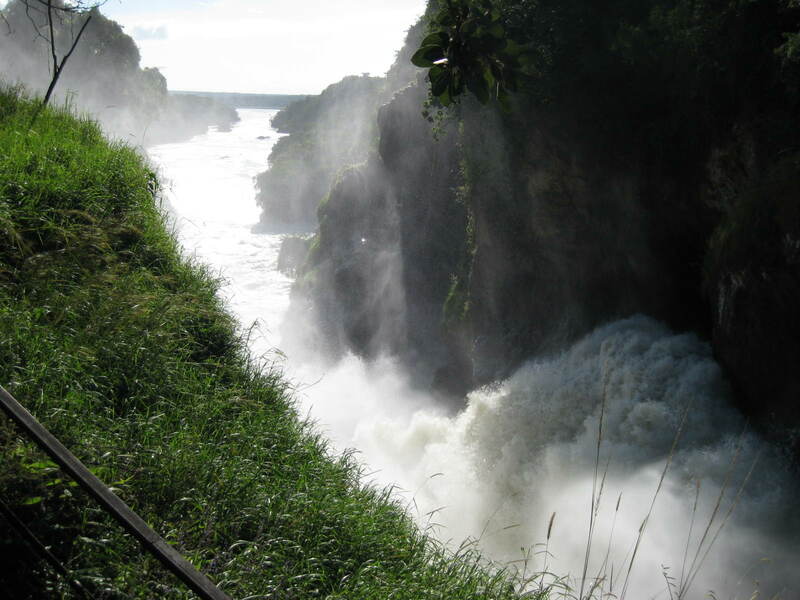 Lake Kivu is the country’s largest body of water and one of Africa’s great lakes. Bordering the Democratic Republic of the Congo and Rwanda, it forms part of the Great Rift Valley. Unlike many beautiful lakes in East and Central Africa you can swim in Lake Kivu as it is totally safe. There are no hippos, crocodiles and no Bilharzia found in the lake which makes it perfect for any water activities. Another option today is a half day boat ride to Nyamirundi Island where you learn and take part in the process of seeing the coffee process from crop to cup. This evening enjoy dinner and sunset drinks before heading to bed. An ideal climate, the perfect amount of sunshine and relaxing lake and rolling green hills, Paradis Malahide is ideally situated in an area of unparalleled natural splendor. Located just seven kilometers from downtown Gisenyi, this beautiful space provides the perfect escape. After a late morning breakfast we will depart for the town of Kinigi near the entrance gate and headquarters of Volcanoes National Park. This park is the home to half the endangered mountain gorillas left, golden monkeys as well as five of the eight volcanoes in the Virunga Mountain chain. After arriving and before heading to Le Bambou Gorilla Lodge, we will visit the Iby’iwacu Cultural Village which gives a glimpse of a community that was once active in poaching activities. The presentations at the cultural centre are very educational in terms of traditional life in a Rwandan village. The community structure, traditional medicine, dancing, archery, and the shift from poaching to a conservation attitude is a great experience and eye opener. This evening dinner is in the cosy dining area of Le Bambou Gorilla Lodge before heading to your room on the beautiful and spacious grounds of the lodge. Tomorrow after breakfast we will take a short drive to the Virunga Park headquarters from where we will head to the mountain to visit one of two habituated golden monkey troops that are available to trek. 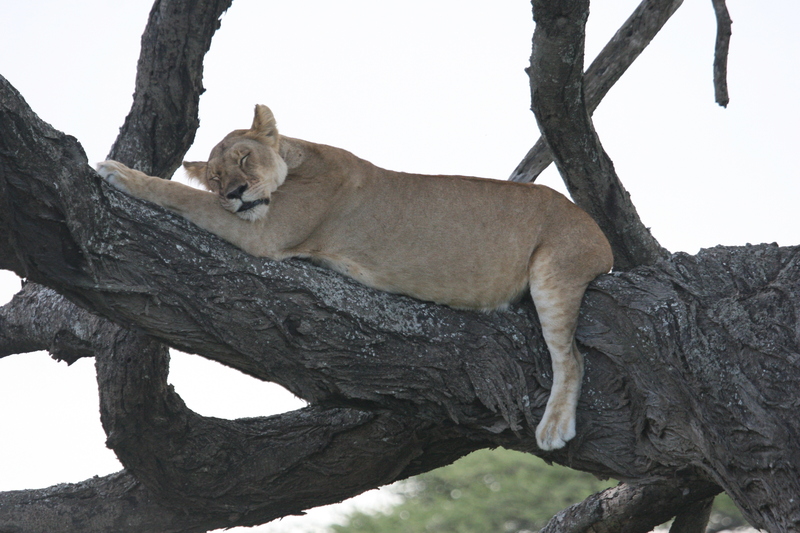 The group of almost one hundred members are very tame and you will be able to see them up close. Golden monkeys is a species of “old world” monkey with a golden-orange patch on their upper flanks and back. Le Bambou Gorilla Lodge is in the perfect loaction for all your activities in the Virunga mountains and the surrounding areas. The rooms in the beautiful gardens are spacious and the food and fireplace always create a feeling that you are at home. 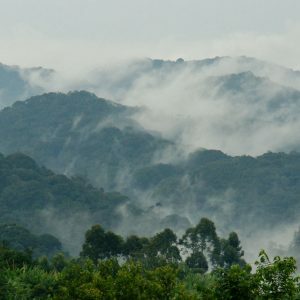 The Bwindi Impenetrable Forest was declared a UNESCO World Heritage site in 1994 because of its rich diversity in flora and fauna and is home to half of the world’s remaining mountain gorillas. This morning after an early rise and breakfast you will be transferred to Bwindi forest (+- 1 hour away) for your Gorilla trekking. Trekkers will ensure that we will find one of the Gorilla groups which can take between 45 minutes and 2-3 hours. We will spend a maximum of 1 hour with the group and the experience of being so close to these beautiful and peaceful animals will stay with you forever. We will return back to Lake Mutanda at around lunchtime. The rest of the afternoon is for you to relax and obviously scan through all the photos that you have taken for that perfect shot. Other activities on the lake and surrounding area is also possible. This evening we will enjoy dinner on the veranda of Chameleon Hill Lodge for a last sunset over Lake Mutanda. 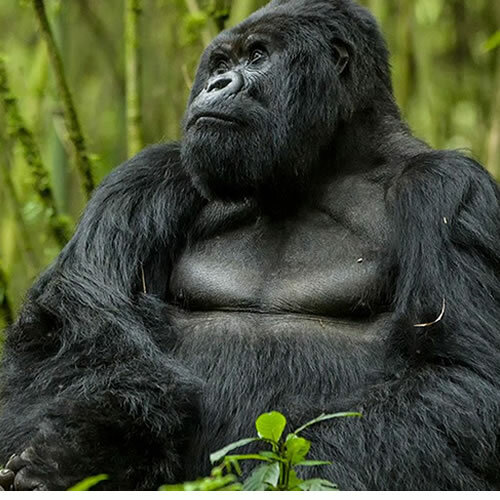 We have added this day at Lake Mutanda just in case of the small possibility that you have not found your Gorilla family the day before and need to trek again. You won’t regret spending another day at Lake Mutanda and even just to relax and take in the beauty of your surrounds will be good. Another option is a guided tour that combines a boat excursion, village walk and an optional ride on a Ugandan “Boda Boda” motorbike across the magnificent Lake Mutanda region. Visit 2 islands en route, interact with the locals and get dusted on an adventurous motorbike ride. Dinner this evening will be at the lodge. The quirky Chameleon Hill Lodge in Uganda overlooks Lake Mutanda and faces the beautiful Virunga Volcanic range. 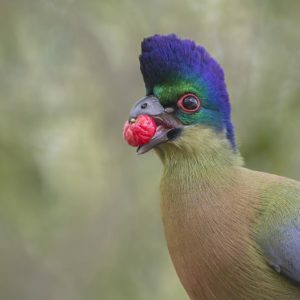 A very relaxed atmosphere in a breathtaking rainforest setting, this lodge features comfortable standard accommodation and serves delicious meals. Eat food and stunning vistas. This one of the kind wilderness lodges brings to light the many bright colours in the different building like these of Chameleons. This morning after breakfast we make our way slowly back to Kigali. Lunch will be at Hotel Muhabura in Ruhengeri where Dianne Fossey spent many nights when she came down from her gorilla camp. Perched atop an ideal vantage point across the garden city of Kigali, Urban by CityBlue is just 15 minutes from the airport and almost all other areas of Kigali. Depending on our arrival time we will visit The Caplaki Handicrafts Market (the perfect place to browse for Rwandan souvenirs) or the Kimironko City Market where all types of colourful and tasty food are sold. This evening have a farewell dinner and sundowners at the unmissable rooftop bar, Sky Lounge, overlooking the city of thousand hills.